So last Friday you may remember me mentioning some exciting things that were happening? Well one of those lovely things is happening today, yay! A few weeks ago I got a wee convo from a lovely lady called Heli asking me to be a guest on her blog 'My day is Friday'. Intrigued I hot footed it over there to have a peek and found the most wonderful blog! Heli tours around Europe (in the virtual sense!) 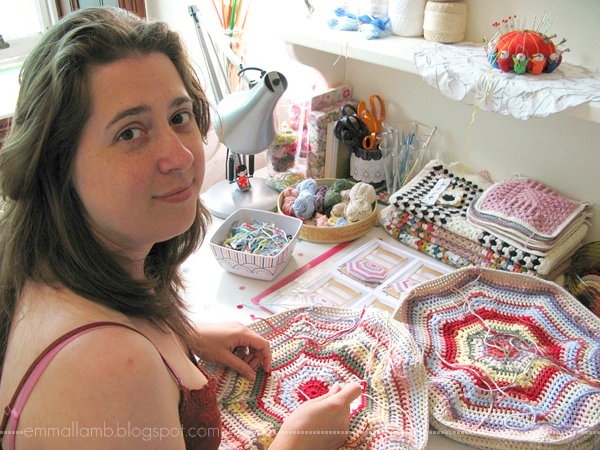 inviting fellow handmade artists and crafters to visually document a day in their life and post it on her lovely blog. Such a fabulous idea! Obviously I said yes immediately, but since I've been a wee bit busy of late I was only able to get around to doing it this week. So if you would like to see what I had for breakfast or where we took Spanner for a walk on a random working day last week, hop on over to see my 'Friday is my day' post. Also, while you're over there I recommend you take a peek through Heli's archives to find some lovely posts from some of my favourite Etsians such as - Carambatack, Lila Ruby King, fric de mentol, La Pomme, Yoola, Star of the East and so many others! Oh, and be sure to check out Heli's Etsy shops too where she sells her beautiful handmade bags and adorable wee brooches! Lovely feature, Emma. Your day looks so balanced. I would love to be able to go to sleep at 10.30.
what a delightful feature! I love this article that Heli does!!! I hope you will have a happy weekend. I LOOOOVED that feature! What a great glimpse into your day- love the picture of you, too!! What a great feature! 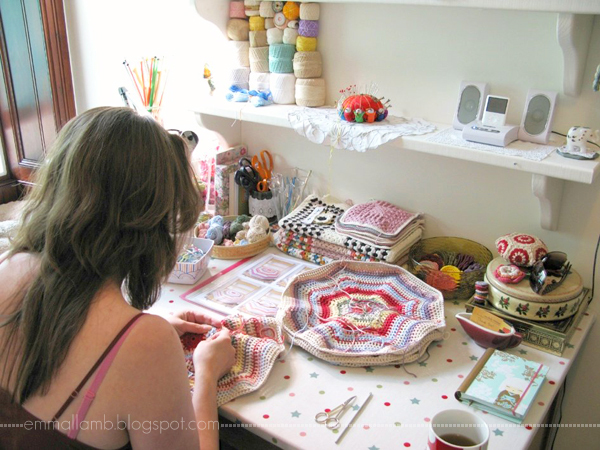 That little basket of crochet just makes me want to get my hook out, lovely! Oh and the beautiful views of Edinburgh, I just love the place. nice to meet you, emma!! Emma, it was so interesting to see how you measure you day, outdoors and indoors. I really like the balance that you seem able to maintain. Of course, your work is marvelous. It is going to be fun to see some of the other artists' Friday features. Thank you for the introduction to the other site. Hey, I have tomorrow off from my work and just might manage to do some afternoon crocheting. What fun, have a great weekend! Loved the interview and her site AND her Etsy shop. Congrats on your interview. Your blog is quite wonderful and I'm looking forward to reading. I loved seeing your Friday thing. Thank you! Are your days always as busy as that or is there normally more/less work? Emma! What a sweet and idyllic day you have! No wonder your work is so lovely! Thanks for sharing, I enjoyed it very much.